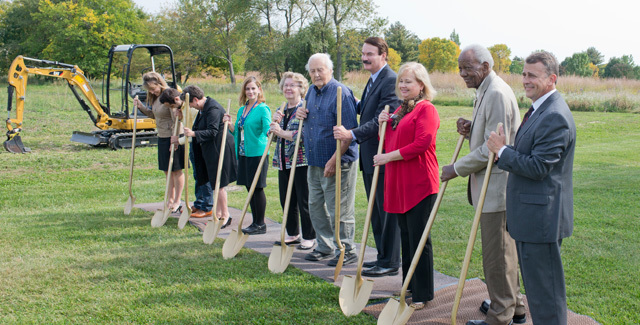 Illinois Central College was proud to break ground at the future location of a state-of-the-art Sustainability Center on the ICC – East Peoria Campus today. Once complete, the estimated 26,000 sq. ft. facility will house the college’s academic programs concerning sustainability, as well as architecture, construction and HVAC/R programs. The building also will function as a community resource center. The building will be LEED® certified and will incorporate integrated design elements which feature renewable energy technologies, natural ventilation strategies, roof gardens, rainwater harvesting systems, native landscape plantings and rain gardens. Some of the features of the Sustainability Center include a Green Resource Center, an all-weather greenhouse, commercial refrigeration and sheet metal labs, an outdoor classroom and outdoor landscaping lab. Land for the new center comes from a generous donation from Charlie and Carol Blye. View the full album of event photos on facebook and a video of the ceremony.